Now see? This is what they really look like. Maybe the wear and tear on the long hood is a bit over done. You shouldn’t actually have the primer showing through but I do like the treatment applied to the trucks. All that great detail shouldn’t be covered over and hidden with a coat of shinny black. 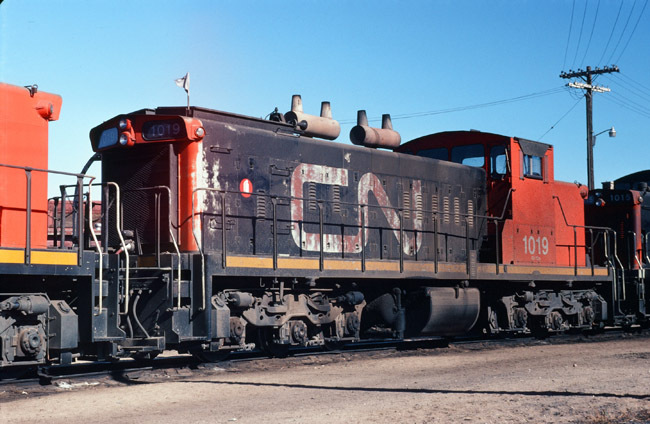 The big bold CN looks good on these low switcher hoods. See the SW1200’s for example. My favourate switcher of all. The spark arresters are classic of course and these machines don’t look finished without them and I wish I could get a realistic white flag. Some I’ve seen look like plastic. Well they are plastic. Not nice at all. Did they only have window shades on the brakeman’s side? Didn’t notice that on any of the other pictures. Of course I won’t be weathering my new locomotive to this extent. I don’t invest that kind of money just to show off my collection of coloured chalks. But I will dust up the trucks and the fuel tank on 1012. As I recall, there was once a manufacturer who released a new engine that was weathered to some degree right out of the box. Dusted trucks for sure. I don’t think that was a success because it wasn’t seen again. That new engine looked ‘old’ and that just won’t do in a hobby where participants routinely find storage for the boxes that the engines and cars came in.